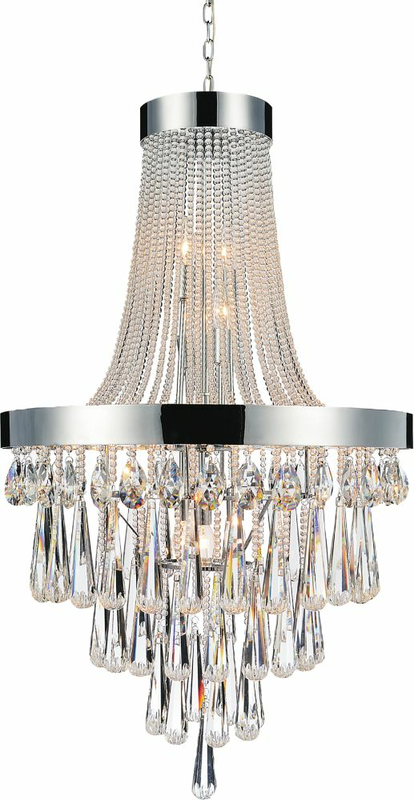 This breathtaking 18 Light Chandelier with Black Finish and Clear Crystals is a beautiful piece from our Jacquet Collection. With its sophisticated beauty and stunning details, it is sure to add the perfect touch to your dicor. This breathtaking 4 Light Chandelier with Black Finish is a beautiful piece from our Padma Collection. With its sophisticated beauty and stunning details, it is sure to add the perfect touch to your dicor. This breathtaking 8 Light Chandelier with Champagne Finish is a beautiful piece from our Pento Collection. With its sophisticated beauty and stunning details, it is sure to add the perfect touch to your dicor. Inspired by the rings of Saturn, the clear panels offer another dimension. A subtle way reflecting light and expanding its reach. Shiny nickel adds to the sleek design updating the classic feel of the chandelier.